Imogen's Typewriter. 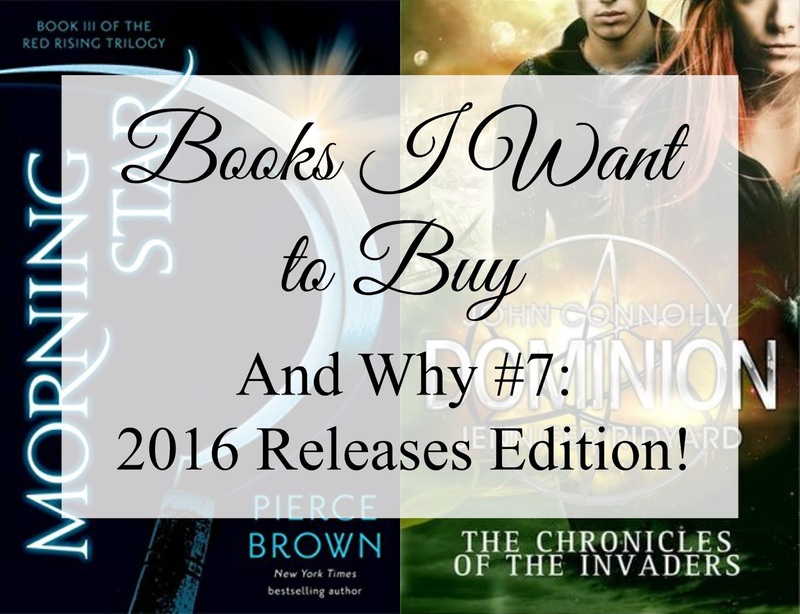 : Books I Want to Buy and Why #7: 2016 Releases Edition! Books I Want to Buy and Why #7: 2016 Releases Edition! As far as I'm aware, this book is coming out on the 11th of February and is the final book in the Red Rising Trilogy. I loved the first book. I thought the second book was good too. And I'm super excited to see where the final book goes. And, of course, the movie! The information on this is pretty spotty but it does look like it's coming out in 2016. I started this series in 2015 and reviewed the first book and the second book within a week of each other. They blew me away and I'm dying for some new information on book three. When I originally wrote this post this read: "I would sacrifice my first born to get a copy of this book. I'm really really really looking forward to this book. I've loved this series from the get-go and it's only got better so I really want Dominion, in my hands, now, please. I'm not sure I can wait until the 25th of February, or if this is the final in a trilogy or if the series will continue (please book gods)." So as you can imagine, pretty stoked about the early copy that's shown up. Review will come as soon as I re-read the series because it's been over a year since I read Conquest and coming up to a year since I read Empire. A new Aurora Teagarden book! This is all circumstantial, Charlaine Harris said on her Goodreads page that the first of two new books to this series will be coming out in late 2016 if she 'gets her wheels on and finishes it'. Recent posts on Facebook hint towards a Fall release. I'm hyped. I love the Aurora Teagarden series! What 2016 releases are you looking forward to?